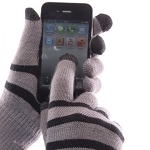 These clever gloves have specially designed conductive material woven into the tips of three fingers on both hands, allowing them to be used with modern touchscreen devices like smartphones, tablets, GPS units and MP3 players. As they are made of a comfy, soft material, you can use them safe in the knowledge that they will not harm your screen in any way. 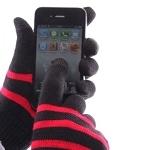 Stay connected without feeling the cold this winter with these handy accessories. 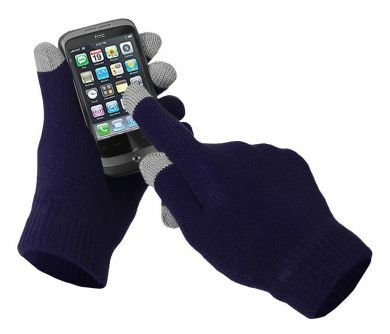 Perfect for anyone who loves their smartphone but hates cold hands. 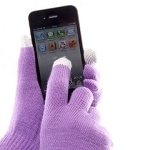 Never have to choose between freezing hands and a workable phone again! 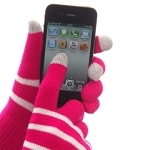 These touchscreen gloves would make an ideal gift or stocking filler, and are one of the hottest gadgets around at the moment. 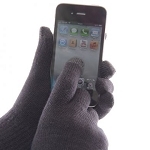 As they are made of a flexible and stretchy material, they are a unisex "one size fits all".